If you look at Biocon’s chronology of business, it started with enzymes based on capability in protein technology or enzyme technology. It was a rational decision to leverage that knowledge base to enter adjacent domains and the obvious choice was pharmaceuticals. As we moved into the pharma space in 1998, it became very obvious to us that the regulatory path for enzymes was distinctly different from the regulatory path for pharmaceuticals. We started with statins, a smaller molecule based on fermentation technology, then we moved to insulin where we went through clinical trials. We now have a whole pipeline of biogenerics that includes insulin, that we have already launched, and by the end of this year, we expect to launch G-CSF (granulocyte colony stimulating factor) and streptokinase (used to treat myocardial infarction) in the Indian market. In less than a decade, we have built up a strong biopharmaceuticals pipeline, while enzymes, which contributed about 10% to overall revenue, became a historical business. But the strong intellectual property (IP) we had by way of novel enzymes in the portfolio helped us get a valuation of $115 million, much more than what analysts had predicted. Will this focus on developing IP become more pronounced for the biopharmaceuticals business as well? When we delinked from our partners Unilever Plc. in 1998 to become an independent company with a focus on biopharmaceuticals, we chose statins as an entry product. That became a big success story, based on which we took the company public in 2004. Initially, statins contributed 70% of the revenues in the biopharmaceuticals business while today, it accounts for just 30%. We have moved on from statins and the next big opportunity for us in the generic space is biogenerics or biosimilars. Certain products have come off-patent, for instance, we have licensed G-CSF to Abraxis BioScience Inc., and that’s going to be huge opportunity for us in the US and European markets. We have already licensed insulin to one company in the US that we are not yet disclosing, but we have also licensed it to Bayer for the Chinese market. We are now trying to take insulin on our own to the European market. Now, when it comes to new molecules, we look at models that are somewhat derisked. As we did when we licensed a molecule from the Cuban institute CIMAB. With some amount of safety data and some amount of efficacy data already there, then you use that for much bigger clinical trials. We’ve been very fortunate that our BIOMab-EGFR, a monoclonal antibody that treats cancer, has translated into a commercial success. In the next 12 months, we expect to get approvals for this product in the European market and we expect it to be a big opportunity in India, where it has already helped treat over 1,000 patients since the launch in September 2006. We don’t have licensing rights for too many territories for BIOMab, apart from Pakistan, Sri Lanka, Middle East and Bangladesh, where we will supply the finished drug. But we have licensed the molecule to a Japanese firm and to a European firm as well. There are also other drugs aimed at rheumatoid arthritis (RA) and psoriasis in the pipeline. What stage of development are these drugs now at? We are now at a critical point. We have the oral insulin product under development, antibodies for rheumatoid arthritis under development. If you look at the pipeline, we have to invest a lot to take our products to market, and investments for R&D are also huge. We had to take a judgement call to sell the enzymes and invest in the biopharmaceuticals business. That is our sustainable business model going forward. We have to focus on delivering the blockbuster drug for global markets, that’s what will help us unlock the huge R&D value that we are developing. We are very, very excited about the molecule we are now in phase II trials for. It has a global footprint. RA and psoriasis are the two big indicators for this particular molecule. We expect to launch this in India in the next three years and globally in three-four years. And then, there is oral insulin, also entering phase II. It has huge blockbuster potential and will be in the Indian market in three years and, a couple of years later, in the global market. You now have cash to fund acquisitions. 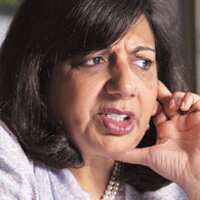 So what is the way ahead for Biocon—organic growth or by way of acquisitions? To develop new molecules, we need to source innovation from, ideally, academic institutions. Indian academic institutions are not yet able to offer Indian industry innovation to build on. In the next five years, it will happen. So we have looked for innovation globally as in the case of CIMAB, which was a jewel not accessible to all because of the embargoes. We could get a lot of very interesting work with the potential to become blockbuster drugs, such as the molecule for RA. There is a lot of people data (clinical trial data) available for these molecules, so the safety element is there, and now it is about establishing the efficacy of the drug. The third part, and that’s where companies like ours can have a huge advantage globally, is in offering affordable drugs. We now aim to uncork this value of safe, efficient, affordable drugs for global markets. To do that, we cannot work ground-up alone, we will look at a variety of strategies, licensing, acquisition and in-house development. So have you identified specific targets for acquisition and how much will you pay for them? I have not looked seriously at any right now. What we want are companies either with good marketing and distribution capabilities, companies with good regulatory capability—by that I mean well-developed capabilities to design clinical trial programmes. Those are the gaps we need to fill today as we get into new molecules. There is absolutely no skill base in India that understands the regulatory needs of new molecules. We are very good at understanding the regulatory part of generics. If you don’t get these skills by hiring people, then you need to acquire companies. We have $100 million available from the enzymes business that can be leveraged, so we can make a sizeable acquisition or a handful to make sure we acquire the right capabilities. We are even willing to start new companies altogether, back companies that have got really high-end innovation. We are are now open to taking bigger risks. Earlier, we wanted molecules that had validated targets, or data in humans at some level. Now we are willing to start at idea level. We have found a couple of such companies in the US and are looking closely at them. In the next 12 months, Biocon will acquire at least a couple of companies. How far away is an international listing of Biocon shares? Do you expect to hive off the services business into independent units before that? The real trigger point for an international listing is when some of these novel drug programmes start looking very valuable. Then you have to invest a lot more in clinical development. We might start by licensing for certain markets. I think over the next two years this will happen, say by 2010 we will be ready. We have to get into marketing on our own, acquire companies which can take these products to market; we need good currency to fund these moves so an international listing looks good. The Indian investor community has still not understood the value of innovation, they are good at evaluating generic companies (but) not able to value pipelines. That is why we will get much better valuation on international markets. The biotech industry in the US is valued based on the pipeline, so that is where we expect to list. You mentioned biosimilars as the next big opportunity for Biocon. What share do you expect this to contribute? That’s just going to be a good steady business that will help us fund a lot of our discovery research, provide a steady stream of revenues. We have done extremely well with insulin. G-CSF and streptokinase will be rolled out this year so our formulations business in India will be a lucrative segment. What is the share of revenues you expect from the domestic market? We clearly see very large opportunities for us in the domestic market. If we are to reach our goal of becoming a $1 billion company, we have the Indian market, overseas market for both generics and services. We expect each of these to become Rs1,000 crore businesses. Right now, domestic sales are less than 10% of overall business, enzymes were 10%, the services business contributed 15%—that includes both Clinigene and Syngene. A little under 10% came from formulations, the balance was from a whole bunch of bulk drugs. In the future, I expect bulk drugs or generics to contribute 20%. We have to transit from that. Services will be 20% and then we expect our domestic market to be 20% and new drugs to contribute 20% of overall revenues. That is our model for the future. Exports are a crucial segment. How will you balance the impact of a rising rupee? Certainly the rupee concern is very grave (as) 70% of our business is exports. There is only so much you can do about forward covering the dollar. We could renegotiate contracts in services and in marketing products you can probably re-price to a certain extent. In services, with a global spread we can try to balance the yen, euro and dollars to some extent. I think we need to get into newer models of contracts for services where have a project-led service models. At present, Syngene and Clinigene together earn about Rs200 crore. We would like these businesses to be at least Rs500 crore each. Syngene will do that soon, so we hope to list them as independent entities sequentially.